We assent to these dogmas (dogma, just by the way, is not a four letter word — but rather, a formally revealed truth) although they remain mysteries, that is to say, they exceed the capacity of reason, while not conflicting with it. No logical contradiction can be adduced to discredit them; they simply lie beyond the province of our natural experience and the limitations inherent in reason (and reason has limitations: we need only ponder the concepts of infinity, infinite divisibility, and eternity to name a few). 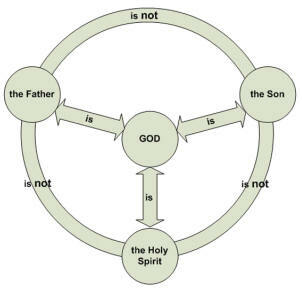 Among these dogmas, or revealed truths, however, none quite so perplexes us as the notion of the Most Holy Trinity. That in and of itself it remains a profound mystery is profoundly true. However, because it pertains to the most central aspect of our faith as Catholics and Christians, inasmuch as it pertains to the Person and nature of God, we attempt to apprehend it in some measure, for only in knowing something, in knowing of its nature, can we begin to love it. We do not love what we do not know, and our knowing defectively or insufficiently results in our loving defectively or deficiently. We wish to know Him well. In fact, we are convinced — and rightly so — that the more we know about God, the more we will find to love in Him, and the more we love, the greater our own felicity ... especially when that love is requited. Too often, in the minds of Christians, God is reduced to the Father only: conceived as an elderly, avuncular figure with a great white beard Who is rather stern and quite distant; one Who is really very little involved in the trivial affairs of men, and so sent His Son instead, and the Son, of course, is less than the Father. What is more, the Son is more compassionate than this remote and rather irascible figure that more resembles Aristotle’s Unmoved Mover, than a Father. We like Jesus — although we fear His Father. In fact, for so many, Christian and pagan alike, Jesus was merely a man, perhaps a wise man, maybe even a prophet of sorts — but not more. Well ... maybe ... but we are not quite sure how. The Holy Spirit? This faceless Spirit, whatever its nature, clearly cannot be that of a person, although He nevertheless figures largely in this mysterious narrative. Quite a conundrum. Many — perhaps most — will reply that there are three gods, or that one is superior to the other, or existed prior to the other, or in fact, that only one is God and the others are something of the nature of demiurges or lesser gods, possessed of remarkable abilities, to be sure, but rather like us in every other way. St. Augustine literally wrote volumes on the subject (De Trinitate), as did St. Thomas Aquinas and many, many, other great and learned Saints. Even the the most modest compendium using the utmost concision will, very likely, avail you little in the way of understanding the most fundamental features of this doctrine, this profound mystery — and in failing to yield understanding in whatever measure, consequently failing to motivate love for that which is not understood. A “Mystery" — many fail to understand —is not something contradictory to logic and reason, but rather exceeds the limitations of human reasoning and formal logic, much in the way that “seeing” incommensurably exceeds any possible description of “what is seen”. What I mean is this: being “color-blind” (actually color-deficient), I have never seen the color “Purple”. I see “Purple” as indistinguishable from “Blue” — but it is not Blue. It is this mysterious visual experience called (by others) Purple. No matter how many carefully crafted and descriptive words you may use, no matter how many analogies you may invoke, none of them will not yield to me the experience of the color Purple. It is beyond my ken because it beyond my experience, and all human discourse presumes shared experiences to their intelligibility. Does purple then not exist because I cannot understand it, still less perceive it, even while others can? In a word, no. Perhaps, then, as it is said, “a picture (in this case a diagram) is worth a thousand words”. So, for the sake of those who should be teaching and do not, or are teaching and know little of what they teach — but most of all for the children, we present you a picture — in the shameful absence of words. Our motivation is simple: if you do not know God, how can you love Him?